Today I’m thrilled to have a very special guest on the show, Shirley Tan. Shirley is someone who I met at the Traffic and Conversions Summit. I actually don’t remember exactly how we met but we hit it off immediately because a long time ago, she founded American Bridal which was a company I competed against when I first got started in ecommerce. Anyway, Shirley sold American Bridal long ago but she’s back with a completely brand new product called The Posture Keeper. Recently, she launched a kickstarter campaign that was completely funded in 18 hours. So today, we’re going to learn her process for manufacturing and how to fund raise like a pro. Steve: Welcome to the My Wife Quit Her Job Podcast. Today, I’m thrilled to have a very special guest on the show, Shirley Tan. Now, Shirley is someone who I met at Traffic and Conversions. And I actually don’t remember exactly how we met, but we hit it off immediately because a long time ago, she founded American bridal, which was a company on my radar screen back in the day because I’m in the wedding industry. Anyway, she since sold that company, taken some time off. And now she’s back in full force with a brand new product called the Posture Keeper. And recently, she launched a Kickstarter for this product and had it completely funded in just 18 hours. And today, we’re going to kind of learn her process for manufacturing her product from scratch, by the way, and launching such a successful campaign. And with that, welcome to show Shirley, how you doing today? Shirley: Hi Steve. I’m so excited to be on your podcast. Steve: So how did we meet actually? It was at T&C for sure. Shirley: I believe it was. I think it was at Traffic and Conversion probably three to four years ago. Steve: I think we just started talking, right? Shirley: I think, well, what it is, is I recognized you from your podcast, and being a follower of yours online. So I was like, hey, there is Steve standing right there. I just got to muster up the courage to go say hi. Steve: Yes. Unfortunately, I’m not very intimidating. Shirley: Yeah, yeah, I approached you. So I introduced myself. Steve: So Shirley, give us the quick background story. I’m actually curious why you sold American Bridal years ago. And then what happened when you took your time off, and why did you come back and decide to release this brand new product? Shirley: So let’s see. So, I created American Bridal back in the 1990s, I’m showing my age here. And from a mail order catalog, we went online when the internet got in that if you so to speak, right, so 1997, right around there. And so that’s when I — I was already in the wedding business for a while. And we sold products to our showroom in our wholesale/ retail business. And when the opportunity in 2009 to sell the business, we had grown it to nearly year over year, about 7 million with actual revenue of six and a half. We decided to — I decided too that I wanted to take it bigger; I want the American Bridal to be become bigger. And I felt that theknot.com who is the premier wedding company, even to this day is the vehicle to get there. They can help me grow it. Shirley: So, that didn’t happen exactly that way. As they say, when you have plans, God has ideas, other ideas, right. And so they bought it from me, I worked there for a whole year. And after I left and two, three years later, they decided to have a different strategy. So, not only did they not continue American Bridal but they revamped their whole e-commerce to move it all strictly drop ship. So, they went from being a fulfillment house in Redding, California, with over 150 people to just a skeleton crew of people who just add products into their platform and then just do everything drop ship. So, I don’t have like direct information since I’ve left, this is just my me guessing. Steve: Sure. So you sold because you thought that your business was kind of plateauing at that time, or? Shirley: Well, so we have actually grown to six and a half million and the prior year to that was probably 6 million, and the prior year to that was four and a half million, something like that. So, I didn’t necessarily think it was plateauing, but I knew that to compete, I didn’t have the financial capital to get it to the next level. Steve: I see, because it was an inventory based business. Shirley: Inventory based business is they had a big warehouse out in Redding, California. Their operational cost was much more efficient and scalable, right. So for that reason, I thought that they would be a good partner to do that. Steve: Okay. And then after you sold the business, you took some time off, and then what made you kind of get back into the game? Shirley: It was a way to stay married. So let’s see. So it’s a double edged sword, right? When you have too much time on your hand, you can get yourself into trouble. And then when you have too busy, you can get your — you don’t have balance of life. So, after I took some time off, I renovated — I have a non compete, so I had to like be a good girl and don’t do anything that would make them mad at me. And then after that — so during that time, I did some renovation to our house. We’ve been wanting to do that for a really long time. So I used to work in a retail hardware store, I have experience in home reno, I love home renos. And so that’s what I did. And so why did I go back? Steve: And tell us about the product along the way, like what it does, and how you came up the idea. Shirley: So, I went to — so during this time when I was working for the Knot and working, I started thinking about consulting. So, I did some consulting for a while. And during this phase of my life, I was already having a lot of chronic pain challenges. And I work for myself now, a little bit more flexible schedule. So, a lot of my days would consist of going to the doctor, getting tests, then taking pain medication, going to physical therapy, you just like, you name it, I did it, right. And it was through all of this frustration that I created my own prototype. I never really set out to be an inventor, I’ve always been more like, hey, I’ll buy and sell products that are already proven right. So I never thought of myself as an inventor. I’m an accidental inventor, if you will. And so through that challenge that I had years ago, I made my own mock up, a prototype that through a backpack basically, that I wrapped around my chair, and I used it in the way that I use Posture Keeper now, which is to hold me up so that I don’t slouch, so that I don’t lean forward, which is my biggest crime in my poor posture behavior, which is I sit at the edge of my seat, I lean forward and I’m leaning into the computer because well, I want to see the computer bigger, better or [inaudible 00:07:35]. I don’t even know that I’m doing it. I think that’s what it is, is most people that do this hunching over, they don’t realize they’re doing it until they’re hours into the behavior. Steve: Yeah, so just for the benefit of the listeners, Shirley has developed what she calls the posture keeper, which allows you to sit up straight in your chair, so that you don’t have problems later on with your neck and your back. Shirley: That’s a great description, I couldn’t have said it better myself. Steve: Just trying to set the scene here. And what I really like about Shirley’s story is she’s not an inventor. She’s never created anything. And yet, she managed to manufacturer this product from complete scratch. And it’s got a bunch of pieces and it’s pretty unique. And so, I kind of wanted to get your story on that, and how you got started with just the manufacturing phase. Can you just walk me through it, because I know there’s a lot of people out there who want to manufacture their own stuff, but it’s kind of intimidating when you first get started. Shirley: And it is, especially when you didn’t set out to go do it, right. So I’ve always bought, I’ve been to the Canton Fair several times, I’ve always seen how you could just say, oh, that’s an existing product, maybe I’ll make it bigger, make it smaller, change this material, this and that. So, I’ve always been able to do that when I’ve seen something and improve upon it, private labeling. Shirley: And I’ve done that. I imported in that context, but I’ve never invented something from zero and go, how do I do that? And so, I actually had — the posture keeper I have today is like my third version of it if we were counting. And I actually initially came — the first idea of posture keeper came from straps. It was just going to be like very similar to the posture correctors of today that’s selling well in the marketplace. So I go some version of that tied to the chair, but it was too complicated, too many moving parts. It was too — when you just look at it, it was like a big gigantic mess. And so I threw that out the door after four months doing that. Steve: So I’m sorry, you created your own? Shirley: So I created — the first initial posture keeper was made mostly out of straps. Steve: Did you make that yourself like you sewed it yourself or? Shirley: Yeah, so that’s another story for that as well. I had to — I don’t know how to sew, I didn’t know how to sew and I can only basically stroll straight lines even today. And I had to cancel some pieces and I had to learn how to operate a sewing machine with this. Shirley: I’m sorry about that. Steve: It’s okay, I’ll cut it up. Shirley: Yeah, I’m sorry. I’m going to turn off the phone. So I literally, I put a bunch of straps together. I bought some wedding material, some buckles and parts and components and started making some things together. Steve: How did that turn into something that you can actually manufacture, though? Shirley: So after three versions of this, I was able to come up with the version that I have now, which is well, you have to put together basically. You have to try all these different pieces. So for example, the lumbar support is a product that currently exists in the marketplace. It’s a memory foam pillow shaping the lumbar, but what the issue was with what’s in the marketplace is most of the lumbar are too thick. They’re over five inches thick. And so my challenge with that is that it pushes you off the chair that you have in a typical office chair because it’s so thick. So, I felt that people would not be happy with that if I’m not able to reduce it. So, there’s this image of me cutting the phone with an — I tried different ways. I manually cut it with a utility knife, so the final way to properly shave off the lumbar pillow was to use a kitchen knife. Steve: Okay, so basically, from what it sounds like you manufactured all your first three pieces by hand. You kind of taught yourself how to sew and all that stuff. I’m just curious like how do you actually take that to a manufacturer? Have you found a manufacturer yet for this? I assume you have, right? Shirley: Yeah, and that’s the first thing I did first. I wasn’t comfortable with launching the Kickstarter without having that piece nailed down. That was critical for me, because I needed to make sure that the factory can deliver on what I show. Steve: Okay, how did you find your factory? Shirley: The factory guy was actually introduced to me by Kevin Harrington, who was one of the original Shark Tank. Shirley: Yeah, so I was very comfortable in meeting him. Kevin introduced me to him. I met him, I saw his process. We went to China and I saw how the factory was going to — how it’s run. It’s not a little small cottage industry that some uncle has put together, and it’s a real bonafide factory that they have standards. Steve: Were you worried about them taking your idea and stealing it? Shirley: Ordinarily, I would be but because I met this factory through the connection of Kevin Harrington and I just knew that at some point you have to trust. And I knew that they weren’t going to do that. Steve: So did you take a pattern to them, or did you just hand them your prototype and say, hey, can you make this? Shirley: Yeah, that’s basically what I did. Steve: Okay. So the factory just had this ability to I guess undo your work and find what all the pieces were and did you have to pay for that upfront or? Shirley: No. And that was the other thing too, when you work with a factory and they see your vision and they’re in it more than just [inaudible 00:14:17]. Normally you would have to, you would have to pay for a sample, you would have to pay for all the different versions and minimum and all that stuff. But because I came into this under, I basically borrowing from Kevin Harrington’s his credibility, his relationship. So, I came into this really fortunately that this gentleman Ken made it very easy for me to just work with him and work with his factory. Steve: Okay, and then we talked a little bit about this prior to the interview, but you decided to patent your product. And I guess that had nothing to do with people copying you in Asia and more for just protecting the rights in the US, right? Or can you just walk me through like the pros and cons of patenting? Shirley: So Kevin Harrington when I first showed him the idea, he encouraged me to pursue it. So, he showed me some other products, he goes your product is better than this other product, and you should file a provisional patent immediately before you show this product to anyone else because I’ve never seen anything like it. And I think you have something near if you do it right. So I said, okay. And so, once I did that, and once you’ve talked to Kevin Harrington, you can’t go back, right. Steve: How much did that cost you by the way to file that provisional patent? Shirley: I can’t remember but it was probably 1,500 or 2200. Steve: So not that much. Shirley: Not that much, enough that I would be willing to take a risk to do it. And then once I was nearing my provisional patent, I think that was April or something like that, then I decide — so I had much closer, right. I had all this year to come up with a final design, what I call the final design, come very close to it, right. And so, that’s when I filed the utility patent because now when you submit that, you actually have to have drawings, you have to describe how the components work, what part does what. Steve: What happens after a year if you don’t do anything with the provisional patent, it just disappears? Shirley: I’m not quite sure. I think you might have to start over again, or you can’t use that and if there was a gap, somebody might say that there was a lapse, and therefore that maybe they can come in, in the middle. I’m not exactly sure and I wasn’t going to try to find out. Steve: Sure, of course it’s not that important. I was just kind of curious. Shirley: I’ve been in it, right. So not just the provisional patent costs, but I’ve spent this whole year working on the prototype, so I wasn’t going to walk away from it. Steve: So it’s funny. So this prototype, you essentially manufactured it yourself, and then you brought it to the factory. And so was there an initial investment on your part at all outside of like the patent I guess? Shirley: Yeah. So I had to have 30 of them made. Once we finally agreed on all the measurements and the bill of material that it takes to get this product produced, I had to bring in my own 30 pieces to — actually how many have been made, 30, 30 plus five. So I have like 35 pieces that I initially brought in to try with friends and family and to get it out to the media. Steve: Did you kick those 30 pieces yourself? Like, it’s weird that the factory was willing to just make 30 pieces for you. Or did you hand make 30 pieces? Shirley: No, the factory made 30 pieces for me. Steve: Okay, so how did you negotiate that? Shirley: With Kevin’s factory guy. Steve: Got it. Okay. So he knew that you were serious. And so that’s why he was just willing to do that for you. Okay. Shirley: And really he believed in the product. It was very interesting story because he let his wife try it. And his wife goes, I want this. I’ve never met his wife, but his wife is on my side. So, that helped a lot, I’m sure. Steve: Why only 30 pieces then in your first run? That doesn’t seem like that many. Shirley: Because the foam had to be manually done. They had to hand — like I said, the readymade foam for the memory foam, you cannot just buy it off the shelf. So they had to cut it to my specification. And therefore they had to do by hand. So like, just like my first two that I did, I did it by hand; they had to do that 35 pieces by hand. Steve: Okay. And then in terms of the price of these first 30 pieces, I imagine it’s a lot more expensive? Steve: Yeah, comparatively percentage wise yeah. Shirley: Yeah, it was ridiculous. I was just like, oh my god. Steve: So you didn’t basically have — like the factory you kind of already got from Kevin and it was kind of pre vetted and you only trusted them. So, all those issues went aside and then they believed in your product so they were willing to do a small production run. Steve: Let me ask you this question. Like if you didn’t have Kevin, like did you try to do this on your own before you met Kevin? Shirley: No. But I would have done exactly the same process, right. I think my hurdle would just be a little bit more challenging unless I get lucky. Which is you find the right factory; they’re willing to do it for you. A lot of it is accommodation. I think I don’t think I’m that special, right, that I just happened to get lucky in this one. But I hear a lot of good stories about factory willing to accommodate the importer or the customer in the right circumstances. Steve: How essential do you think it was that you actually went to the factory and met with the guy? Do you think you could have accomplished all this stuff remotely? Shirley: Maybe, maybe. I mean, I met with this guy, I met his people. He picked me up at the hotel, with my factory guy. So, we had meals together, it’s a lot of relationship, right? They think I’m funny because I’m Chinese, I look Chinese, but I can’t speak the language. So they just think I’m kind of funny, kind of like what kind of a Chinese person are you? Steve: Yeah, that happens to me all the time too. Shirley: And to find that you don’t speak Chinese. Steve: Actually, what happened to me was I tried to speak Chinese to them. And then they replied back in English. Shirley: I feel you, brother, I know what you mean. Steve: So what would you say were some of your main challenges just on the manufacturing point, before we kind of moved on to the Kickstarter? Shirley: I think it’s still the communication. There’s a lot of details, I’m a stickler for detail. I still drive, even though Ken is — my friend Ken, the factory guy is now leading all of this. And he keeps telling me, don’t worry Shirley, I got it because I am that kind of personality. I worry about everything. And therefore, I need to make sure I double check, triple check everything. So that’s just, it’s just my own anx [ph]. Steve: And in terms of like the kitting, there’s a lot of pieces in your thing. Are they in charge of sourcing all the little pieces and assembling it all together? Steve: And everything is just kind of available in China like all the parts and everything. Shirley: Yes, but things takes time, right? So my advice to people who are listening and wanting to do something like this where you have, the factory don’t make everything, they have to source the components. So it’s about availability, it’s about timing; it is also about how resourceful they are. So, I mean everything is made in China anyway. But it’s still a challenge of procuring the number of units that you want to get it done. And a lot of how much the factory end up pricing a product depends on the pricing that they can get if they have to buy components from places that they don’t really make. Shirley: So keep that in mind as a factor. And just because they quote you this first price doesn’t mean that it will always be that way. As the volume goes up, they can go back to their component supplier to say, hey, our volume just went up; we are now buying 20,000 of these pieces. How much is it? Steve: Right. So Shirley, you got these 30 pieces. Why did you decide to do a Kickstarter versus selling an Amazon? Shirley: So, I really had for long, I struggled with that same question for a really long time, at least a couple of months and one, because with Amazon I’m familiar how to do it, right? I sold off stuff on Amazon, I know how to – there’s a lot of resources on that. I’m part of different groups and I have a lot of resources to help figure that out. With Kickstarter, I’ve never done it. I only have a handful of friends that have ever done Kickstarter. And so, I wasn’t even sure how to go about it. But I think the reason that pushed me over in making that decision of doing a Kickstarter is one, I wanted to see if I could do it. That’s probably a big chunk of it. And then too, I really believe that for something that is not a ‘me too’ product that you need that push, you need that early adopter community that will come in and say, I’ve never seen this before. I really like the product; I want to support the creator and that community to give you that social proof. And also, it removes my risk, right? If this community of people who I don’t know is willing to come in and give me their pre order, they’re willing to give me their money, trust me to create it. That gives me that proof that my product has greater potential to be adopted by the masses. Steve: I guess your product is a little unique in that aspect. Like, people probably aren’t searching for posture keepers on Amazon, right? Do people actually search for these types of products? Shirley: Posture correctors, posture trainers it’s like actually a good category. There’s a lot of skews now coming up under that space. Steve: I see. So conceivably, you could have listed this on Amazon because there is search volume for these keywords. Shirley: Conceivably, I could have done it that way. I just thought that the Kickstarter community is so cool and that again, if I could get these early adopters to give me that social proof. And also, remember, I’m still in the pre order stage, right? So I don’t have to risk inventory right now if I didn’t meet my campaign goals. And so, whereas with Amazon, I would have to tell the factory guy says, yeah, you need to give me 3,000 units before for the rest of it. Now, hey, I’ve been nice to you all this time. Now, this is official, right? And he has to not give me a small team to make it but now he has to run it through his regular production. So that changes things. Steve: Okay. So would you recommend that everyone do a Kickstarter then prior to just taking the risk up front with all the inventory on Amazon? Shirley: I think it depends on your stomach for capacity to ride the wave, I guess. I mean, Kickstarter can be — the biggest challenge I had was — is building the email list. I have to admit, it’s a big struggle. Steve: Okay. I mean the reason why I’m asking you this question is because I kind of know how Kickstarter works. And it’s not like you list something on Kickstarter and it magically generates money. You have to promote your own Kickstarter, right? Shirley: That’s right. That’s right, just like you would have to promote your Amazon listing, right. It’s not any different from that. Steve: I guess the differences though, is that Amazon has this huge built in marketplace. Kickstarter kind of does too, but you kind of need to jumpstart it before you get to leverage any of that traffic, right? Shirley: That’s true, before the organic algorithm kicks in for your product to rank. Steve: So you said that you didn’t really have a huge email list and it was a problem. So, did you have an email list prior to your Kickstarter? Shirley: No, no. My email list consisted of friends and family and people who I’ve done business with in the past. Steve: Okay, so how did you meet your goal in 18 hours? Like what was your process? Shirley: I cultivated that email list like you wouldn’t believe. So I just like I just went after, you have to work with what you have, and that’s all I had at the end of the day. And we had actually some smaller number of email list that we’ve been doing for pre launch, our pre launch campaign. Steve: How did you do your pre launch campaign, how did that work? Steve: Okay, it was that successful. And how much were you paying per lead? Like, do you remember? Shirley: Yeah, it was pretty high. So, in the early stages, it was probably about 5, $7. And I think we got it down to about $3 or so. Still pretty high is what people tell me. Steve: Per lead, right. And did you separate out those people when the Kickstarter came on board? Shirley: They’re definitely not different bucket lists in our email. Steve: Okay. And were they profitable, like the ads ultimately? Shirley: I think some of those people; I mean they’re targeted ads, right? So those people did sign up. I couldn’t tell you at this very moment, because we’re still in the middle of all this. I couldn’t tell you how many of it came from that list, because some of these people bought under a different name. Sometimes you can’t tell from the email some people sign up. Steve: So you developed a pre launch list via Facebook ads, do you know how big that list was approximately? Shirley: Yeah, it was just slightly under – let’s see, probably was slightly under 350ish or so. Steve: Okay, yeah so not that many. Shirley: It’s very small from what people tell me. Steve: So you took that list and then you pointed that at Kickstarter, what am I missing? What about the other like how did you generate so much money so quickly? Shirley: So a lot of it came through from the friends and family lists and the people who I have done business with in the past. So on that email list, I had I believe probably 3,000 or so. Steve: Oh, wow. Okay. And these are just colleagues that you’ve worked with? Shirley: People — if you are on my Gmail and I emailed you, and you emailed me, you’re on my list. Steve: Okay and these are just like personal contacts that you’ve had. Shirley: Over the years. I mean like you, I know a lot of people through conferences and just being in the business for so long. And a lot of those people supported the campaign. I’m really humbled and grateful and just — and they came through. I didn’t even set out to complete the fully funded within the first 24, the first day, if you want to say. But during the afternoon, about five o’clock when I saw the number at seven, I was saying, hey, wait a minute; we could do this, right. So really, I just like just reached out to all those people, even after I already emailed them, like okay, come on, you guys. You guys, we can do this. So, really supportive group of people that really want to help me out. Steve: Did you get any momentum from raising all that money so early, like did Kickstarter end up featuring your product? Shirley: So I shortly learned, I was shooting for — it’s called stock pick, right, or campaigns we love or something like that. And I shortly learned that they don’t do campaigns we love if your product is somewhere what they might feel that it’s close to being a medical product. So, even though my product is not really medical, but they feel like it might be borderline and therefore if it’s borderline then they just kind of push you over to that category. So, I was bummed to hear about that, of course I didn’t know that before I got in. So, not that it would really change anything, but it definitely would have boosted my campaign, more visibility, right. Steve: I guess what I’m trying to get at is did Kickstarter actually help you raise the money in any way? Shirley: I think so. I think so, a lot of it is ranking, so you rank on different categories, like product design. And so that initial push that they give you, they give you the benefit of the doubt, if you want to call it that. And then they ended — until new projects come on, if you’re able to hold the momentum, then you don’t get pushed down, or even as new products are coming in and they’re popular too, there’s a lot of good products. So you have to be able to hold that momentum. Steve: So now that you’ve met your goal, and I guess your Kickstarter has as of this recording of 22 days left, after that initial push what is your strategy to kind of make even more sales? Shirley: So, one of the things that we’ve done is sign up with an agency to drive momentum, they have their own list of super backers that they have access to cross marketing campaigns. So cross promotional campaigns, so I’m counting on them to do what they’re really good at, right. So, I really come to respect that the agencies can really add a lot of their value to the campaign because they just done so much of it, right. And initially, I thought I could cobble it all together and work pieces because I’ve done, I alluded to doing construction earlier in our call. And so I I’m used to being the general contractor. I’m a really good project manager and organized in that way. And so, I thought I could cobble it together by being the general contractor. But now I realize that when you don’t have a big list, you don’t have a community which other people do, right, they start off with a big community, and then they leverage that community to drive the traffic. When I don’t have those pieces, you’re going to have to use something else if you want to get closer to a higher number. And that’s what I’m hoping for. Steve: Okay. And I know the agencies take quite a bit cut, and so if it doesn’t end up being that profitable, are you just doing it for the emails at this point? Shirley: I’m doing it for the emails and also still my outlook on this is that can I get this product in more people’s hands, because if I could get in people’s hands and they use it, then post Kickstarter life that there’ll be other people going, yes, I missed the Kickstarter but I want one. And I don’t care. I don’t care if I don’t get it for the early bird price. Steve: Okay. No, that makes sense. And then by the way, I’m going to post the link to Shirley’s Kickstarter underneath this podcast and it’s very well done. And I noticed that you actually got some doctors to endorse it. How did you get them to endorse it? And what was your outreach, like what was your outreach plan outside of your friends and family? Shirley: So, I actually developed this product with help of a chiropractor and I’ve been showing him the product. I’m not a science person right, I don’t have a medical background, but it was through all my challenges that he just basically said you need to sit upright. And if you stopped leaning forward, your nerves won’t be pinching; you won’t have all these problems or less of it. So, that’s really what precipitated this product, this backpack invention years ago. And so when I was started making this product, so I said to him, why don’t people just use the backpack like I did, right? He goes well, because you’re going to incorporate a lumbar support system that the backpack don’t give you right and it has to be comfortable, it has to be you can get in and out of it easily. Steve: In terms of proving to people that it works though, how did you accomplish that? Shirley: I think when people see it and they — so people go, yeah, I always get skeptical which is actually fine. I like that because when they actually use it, they go oh my god. So intellectually they understand, but when they sit in it they go, oh my god, this is amazing. It really will not let me lean forward. So people get it instantly especially after they’ve tried it on. So, I hope that the videos and the campaign images and through the imagery we were able to accomplish that, but people are smart, they can see it. Steve: So what is the future? So once the Kickstarter is over what is your plan? Shirley: So, we’re going to deliver, we’re already working with the factory to get all the materials together where we have to estimate how many pieces we’ll get made. And so we’re preparing all of that, we’ll deliver on all the Kickstarter pledges first, then after that we’re going to set up shop on – we’ll turn our Shopify store into a shopping cart, and then I’ll probably sell on Amazon. Steve: Okay. And then in terms of Amazon, I guess, is most of your efforts — I guess what is your plan? Is it to focus more on Amazon, your own shop, or is that TBD? Shirley: We’re going to do both; we’re going to do both. I think we — I mean you cannot be in e-commerce without being on Amazon these days. But at the same time, I think what we could do is maybe — so as an example, there’s other colors, right? There’s other colors, there’s other personalization that we can do to the product that we can offer on our Shopify store and on Amazon we could just offer let’s say, the black right, a black available everywhere. And that will be the one that we will sell most of. But other people want — some people want other colors, they want other personalization. So, we have to think through those pieces of how we want to differentiate so we don’t compete with our Amazon business if you will, and still be able to build up this other our other ancillary related products. Steve: Cool. Yeah, well Shirley, definitely going to post the link to the Kickstarter beneath this podcast on the show notes. And if any of you guys have posture problems, or anything, I encourage you to check it out. And Shirley, where can people find you online? Shirley: They can find me on LinkedIn, I’m Shirley Tan. They can find me on Facebook, Twitter, I’m everywhere, Instagram, so I’m everywhere. 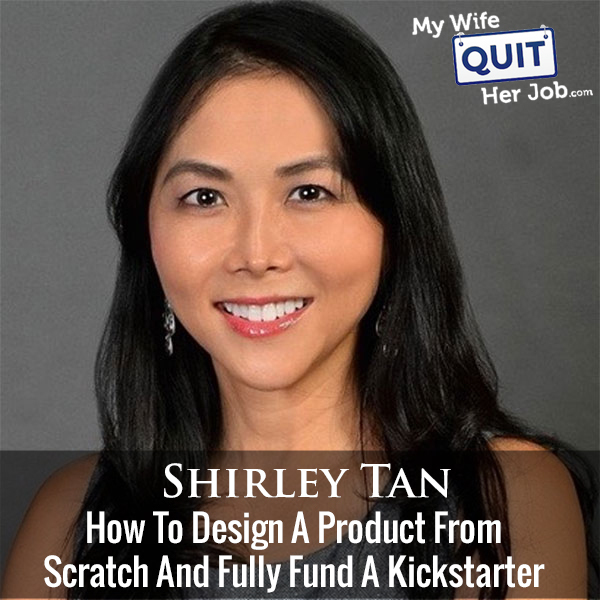 Steve: Well Shirley, I appreciate you coming on the show and teaching us how you manufactured your product from scratch and launched a successful Kickstarter. I mean, from my gather from this interview, a lot of it is just hustle. And you created your own prototypes. You found the factory and then just through networking, you had contacts and then from there you decided to launch a Kickstarter and the Kickstarter is just very thorough, it’s actually very well done. It’s one of the best I guess Kickstarter campaigns that I’ve seen, just very thorough. It’s like this endless long form sales page. Shirley: Yes. And I really, I spent weeks and weeks on this and going back and forth, how detailed, too much detail, back and forth. In the end, I didn’t want to — I wanted people to see all the benefits of having improved posture and correcting that behavior that you can correct the behavior with the right device. Steve: Yeah, no, absolutely. I mean, if even if you guys aren’t interested in the product, you should go check it out just to see how thorough the Kickstarter page is. Anyway Shirley thanks a lot for coming on the show. Really appreciate your time. Shirley: Thank you Steve. Thank you so much.